First, you acquire some iconic Texas land. Then what? ﻿﻿﻿﻿﻿On a crisp November day, when the last vestiges of fall foliage cling tenuously to deciduous trees in the Cross Timbers region of North Texas, John Ferguson rattles uphill on a bumpy ranch road. His destination is a 1,200-foot mountaintop where one day campers will marvel at the stars and pedal along backcountry trails. Below him in the distance, the waters of Tucker Lake shimmer at the heart of Palo Pinto Mountains State Park. The state park property was purchased in 2011 with money from the Texas Parks and Wildlife Department’s sale of an undeveloped 400-acre Eagle Mountain Lake site near Fort Worth. The Palo Pinto acreage is composed of more than 4,000 acres of former ranch land straddling the Palo Pinto/Stephens county line plus 120 acres surrounding the lake, donated by the City of Strawn. The Eagle Mountain Lake proceeds allowed the state to buy the original 3,300 acres for the new state park and purchase additional nearby acreage as it came on the market. Having the land in place is just one step, though. The agency’s acquisition of property for a future state park or state natural area signals the commencement of a complex, arduous, time-consuming process that can take many years to complete before the gates swing open. The road to opening celebrations at a state park is a long and winding one. With lots of bumps. It’s not a big stretch to say that creating a state park out of a raw piece of property is akin to a woman giving birth, but instead of taking nine months, “delivering” a state park can sometimes take nine years. TPWD Executive Director Carter Smith takes the long view when it comes to acquiring land that will one day become a state park to welcome the public. State funding drives the park acquisition and development train. 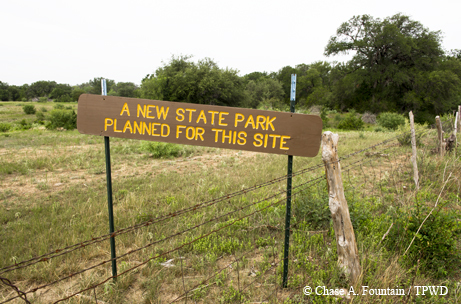 The last significant spate of new state park development occurred in the 1970s and ’80s through $75 million in park bonds issued during Texas Gov. John Connally’s administration. Until recently, Government Canyon State Natural Area in Bexar County, purchased in 1993, was the last significant piece of property purchased by TPWD. Five properties in the state parks inventory are as yet unopened to the public: Davis Hill, Palo Pinto Mountains and three state natural areas — Chinati Mountains, Albert & Bessie Kronkosky and the Big Satan Unit of Devils River. “Our capacity to work on the myriad tasks that go into planning, designing, developing and opening a new state park is limited to only a couple of parks at any given time because of staffing limitations and funding challenges,” says State Parks Director Brent Leisure. Today, those two properties are Kronkosky and Palo Pinto Mountains. The Kronkosky Foundation donated the 3,800-acre 3K Ranch to TPWD in January 2011, just before the Palo Pinto purchase. Why aren’t those two sites open to the public yet? The process of creating, funding and developing a new state park requires due diligence that takes time. “When we go in and construct a new state park away from everything, it’s like building a small town,” explains lead park planner Chris Beckcom. Park planning follows a prescribed timeline and has many moving parts (see chart on next page). The process begins with a wide-ranging, thorough baseline inventory of the property’s existing conditions — physical attributes and biological and cultural resources — to help planners determine which places will be used for public recreation and which areas should be protected for endangered species and archeological and environmental concerns. Based on those findings and input from local community leaders and the public, park planners create a public use plan that will guide development of essential infrastructure like roads, utilities, structures, campgrounds and trails. Then, TPWD must secure adequate funding, typically through legislative appropriations, to pay for the design phase of the project. TPWD’s Infrastructure Division members survey and map the property (denoting such things as topography, soil conditions, existing pipelines or other structures) and prepare architectural plans and construction documents. Small-scale development is usually handled in-house, while larger-scale projects requiring construction of numerous buildings and multiple camping loops may require outsourcing. Park design can take up to two years to complete, followed by the construction phase, which can take another two years, depending on the exent of the facilities being built. 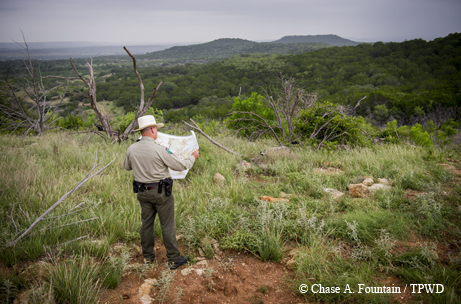 Before the park opens, a comprehensive general management plan must be completed that includes the public use plan, a resource management plan, an interpretive plan and an operational plan that guide the actions, strategies and role of the specific park in the Texas state park system. With such a lengthy timeline and ongoing funding and staffing issues, why should the state even bother with acquiring more parkland? Buying land now is a matter of “land banking” to preserve significant natural areas of Texas, says parks administrator Kevin Good. These properties can be developed as financial resources become available. Of course, all the planning and adherence to the process that moves a project along are subject to the whims of disaster, such as Hurricane Ike and the wildfire at Bastrop State Park. Such is nature’s way. Located just north of Interstate 20 midway between Abilene and Fort Worth, Palo Pinto Mountains is projected to be one of Texas’ busiest state parks. Resources have been inventoried, site analysis completed and one of two planned public meetings held. TPWD will be receiving $2.7 million from the Texas Legislature in 2016-17 to underwrite the architectural design and engineering that will guide development at the park. Superintendent Ferguson, who lives with his family at a residence just inside the park, says Strawn’s civic leaders equate landing a new state park to “winning the lottery” since it will bring jobs and thousands of visitors to the small, sleepy former railroad and coal mining town. The new park has a historical tie to the state’s oil industry, as it’s the location of the first well drilled in the prolific Ranger Oil Field. 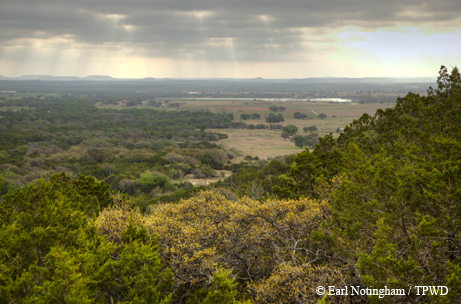 Future campers will have scenic views from the hilltops at Palo Pinto Mountains. The state park, which lies roughly 70 miles west of Fort Worth, one day will host scores of swimmers, paddlers, anglers and horseback riders. 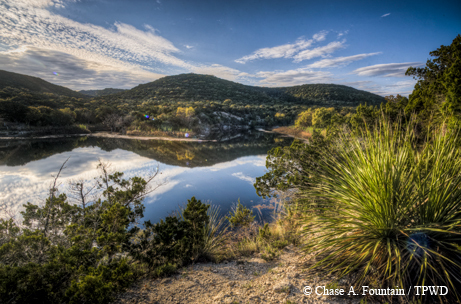 The rugged and ecologically diverse Cross Timbers property features two miles of frontage on the north fork of Palo Pinto Creek, 80-acre Tucker Lake, stunning hilltop vistas, canyons, meadows, streamside forests, pecan bottoms and upland woods. Ferguson has allowed limited use of the park, hosting astronomy groups, birders, equestrians and hikers. It is not unusual, he says, for more than 100 people to show up for the occasional organized horseback rides and stargazing parties. He envisions one day hosting mountain biking events and extreme adventure races. Cabins and cottages overlooking the lake are among the proposed facilities included in the park’s development, whose total cost is projected at $30 million. Two large campgrounds, an equestrian camping area, a recreation hall, park headquarters, a maintenance building, day-use picnicking areas and 32 miles of backcountry trails with primitive camping are planned. Ferguson believes the opening of Palo Pinto Mountains could still be up to six years away. In the meantime, he will be expanding public access and hoping that funding comes through. James Rice, who spent eight years with TPWD as a wildlife biologist, arrived at Kronkosky in 2013 to oversee the property and begin the first steps toward an opening that could still be a decade away. On a recent visit, Rice was behind the wheel of a four-wheeler as he bumped and splashed along one of the few passable ranch roads of the sprawling former Kronkosky family retreat. After visiting bucolic Bessie’s Pond and covering another mile or so, he disembarked on a creek bank and slogged his way downstream to an idyllic spot marked by a monster live oak, where crystalline spring waters cascade over a 10-foot limestone ledge. Someday, visitors will be able to hike to such scenic spots and hike and mountain-bike along backcountry trails through cedar brakes and up into the higher elevations in the western reaches of this remarkable property. They will emerge from tents in a small campground to be built not far from a new park headquarters to hike, bike, fish and relax in a natural setting that will become increasingly cherished amid Boerne’s growth and San Antonio’s urban sprawl. Kronkosky State Natural Area boasts spring-fed creeks and a large pond. Recreation, however, plays second fiddle to resource conservation at Kronkosky, which carries a “state natural area” versus “state park” designation. The donated Kronkosky property, located in the Edwards Aquifer contributing zone, epitomizes classic Texas Hill Country. The biologically rich property was never ranched and has been high-fenced since 1998, resulting in an unusually low population of white-tailed deer. As a result, the ranch hasn’t been overgrazed or overbrowsed and supports a remarkable diversity of plant species, including the rare sycamore leaf snowbell, silktassel, Texas madrone, palmetto, Texas wild mercury and endangered bigtooth maple. An amazing cast of critters, too, calls the area home. Rice, his small staff and a host of volunteers have documented the existence of endangered golden-cheeked warblers, a nesting pair of zone-tailed hawks, Texas spring salamanders, slimy salamanders, alligator lizards, monarch butterflies and more amid canyons, spring-fed creeks, maidenhair fern-draped seeps, mountains, a large pond, live oak-ashe juniper woods and grasslands. Sitting just seven miles south of Boerne and about 20 miles from San Antonio’s western city limits, the Kronkosky property is ideally situated to draw sizable crowds of urbanites seeking an outdoors retreat. Rice says early inventories and plans are nearly complete, but without funding to begin the design phase, progress will soon grind to a stop. “There are lots of hungry dogs at TPWD and only a few bones,” Rice concedes, noting it could cost $16 million for development and $500,000 a year to operate Kronkosky. While money is the main stumbling block in the process, Rice also recognizes the delicate balance that must be struck between recreation and preservation at a place like Kronkosky. The process is long and complicated, but the payoff lasts for many lifetimes. Our children’s children will one day delightedly spot golden-cheeked warblers at Kronkosky or fish the shimmering waters of Palo Pinto’s Tucker Lake, thanks to the efforts of those who are starting the process now. What's the difference between a State Park and a State Natural Area? State parks (such as Palo Pinto Mountains) are areas of natural or scenic character developed to provide recreational opportunities. State natural areas (such as Kronkosky) preserve areas with outstanding natural attributes; their primary emphasis is on protecting those resources, not on recreation.